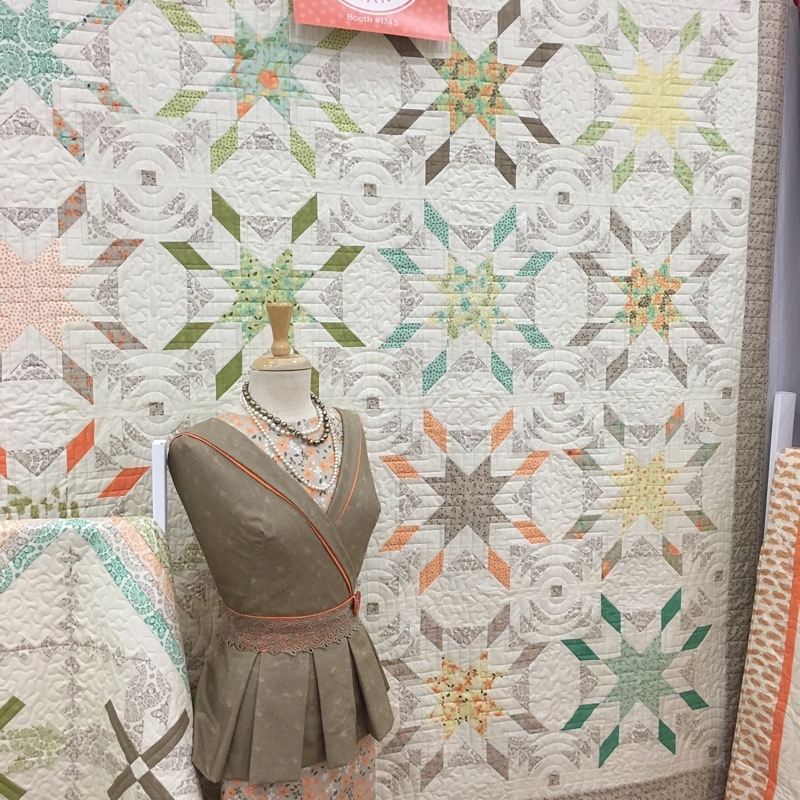 This is where I wanted to start – it’s really the only place to start this year’s Quilt Market for Moda Fabrics. Forty years ago, Mark Dunn started his own company. He called it United Notions. It grew, it changed and it created a division called Moda Fabrics. 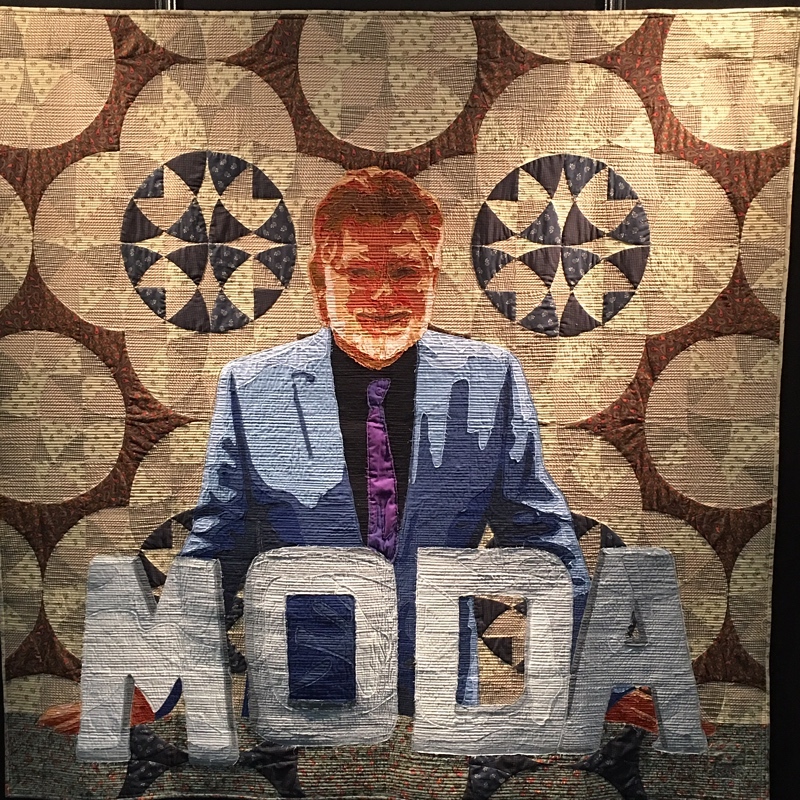 United Notions continues today as a major distributor of books & patterns, threads, notions and batting, and other quilting and sewing tools but when most of us think of Mr. Dunn and his business, we think of Moda Fabrics. 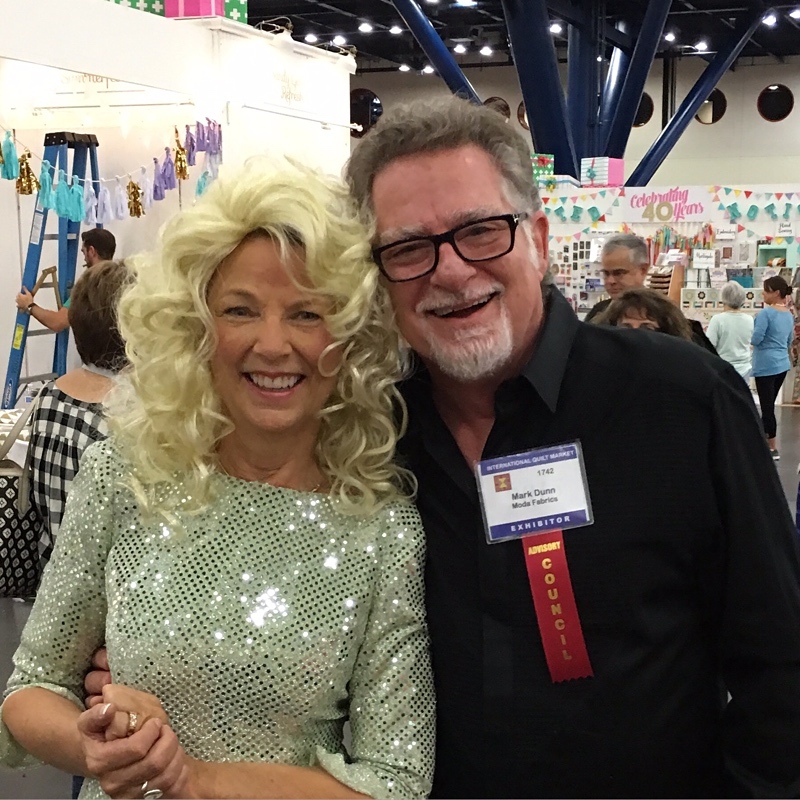 So we’re having a party – an anniversary, birthday, celebration… all rolled into one big shindig at Quilt Market. The booth wasn’t quite finished yet – no carpets, chairs on the tables, some random boxes around, etc. More pictures coming tomorrow. But I wanted you to start getting a feel for the place. The big pillars in the booth – this area is called “the pit” and there are technically four “pit areas”. This is where the reps meet with customers to show the fabric lines. The boxes on the top of the booth are wrapped and there are quilts spilling out of them – obviously on the other side of where I took this picture. 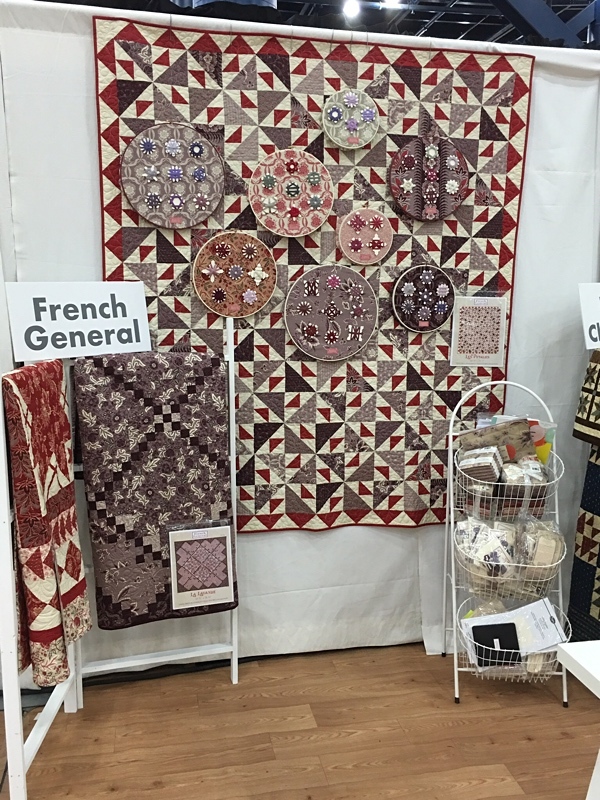 The quilts are in the same patterns and colors as the wrapping paper – everything is a two-color quilt done in the “theme colors” of the booth. 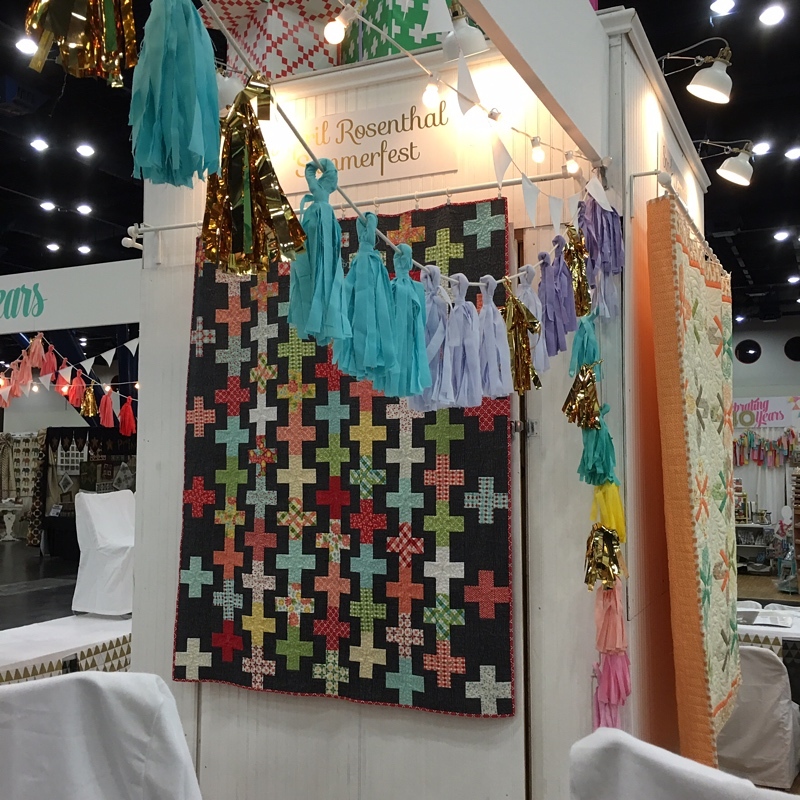 While they had all sorts of advice – solicited and not-so-much – the booth is very much the work of Lissa Alexander and Holly Hickman. 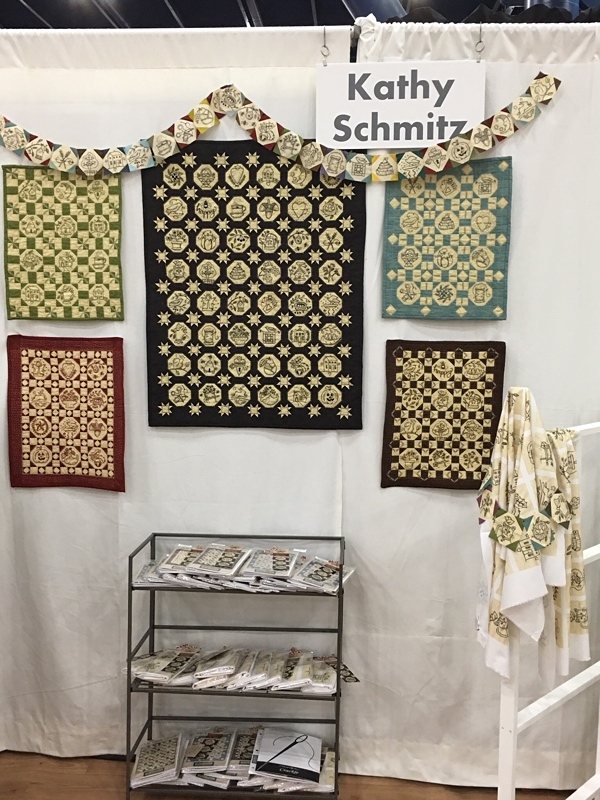 The designer parts of the booth are mostly done and there will be more pictures later, but there’s enough to start sharing some of the quilts, fabrics, and all the pretty stuff. I love this picture of Sandy with Mr. Dunn. There was a Schoolhouse presentation for the upcoming Moda All-Stars All-In-A-Row book from Martingale and the theme was a “beauty pageant. We were encouraged to go “all out”… “put on the glam”… and “work it”. Sandy wore a dress that she first wore in the early 1980s – and it fit her perfectly. Sandy may be Moda’s “oldest” designer but the girl still looks awesome – and if you’ve never met her, she truly is one of the nicest, funniest, truly most wonderful people in the business. There is a reason why she’s “lasted” – it’s not just her incredible talent as an artist. Jan Patek! Her new collection is Garden House. Black, a vibrant red, a cornflower-soldier blue, sage-ish green, tan and natural – this is one of my favorite Jan-collections. 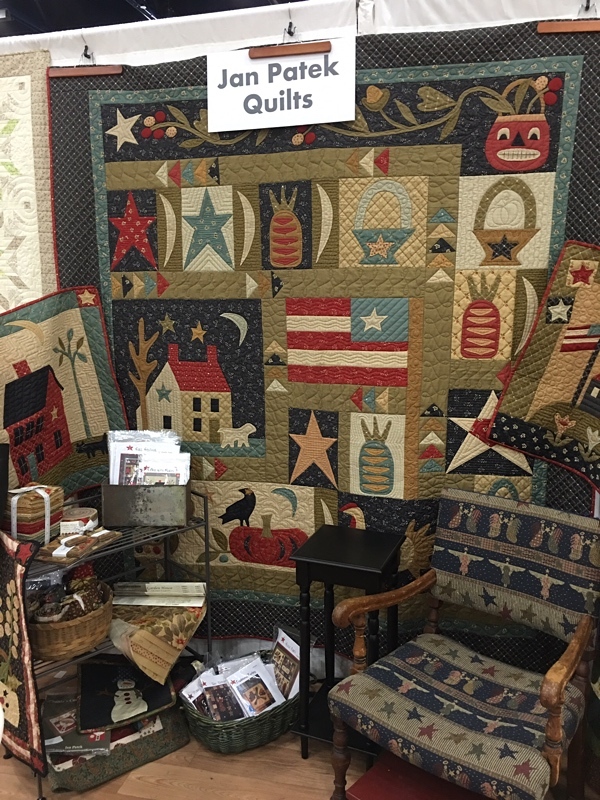 And as always, Jan’s quilts are that unique mixture of folk art, primitive and traditional that is her signature style. Lynne Hagemeir of Kansas Troubles is next – I hope you’ll forgive me but I’m going down the row of the Moda Designer Studio. Lynne’s new collection is Bees ‘n Blooms. Lynne has done minis – again. I don’t want to say that Lynne is old… but Lynne (and Sandy, Jan and a few others) did “minis” the last time they were the hot new thing. They were babies at the time… in their early teens. Deb Strain – another one of Moda’s gloriously talented artists who paints, draws, does calligraphy and brush-lettering. Deb’s new collections is Bee Creative – yes, bees are “big” this year. 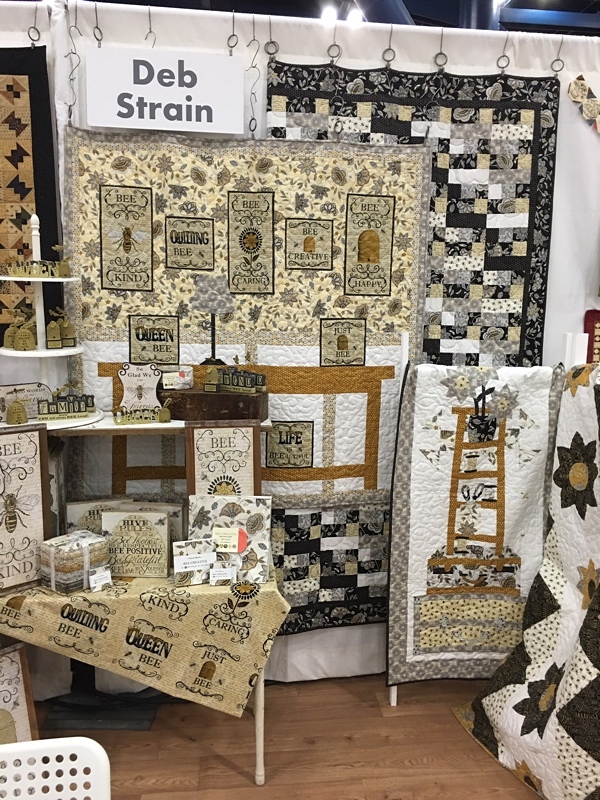 It’s a gorgeous collection with a big floral print, two terrific text prints and terrific “blender” prints in shades of cream, gray, black and honey-gold. Another one of Moda’s supremely talented artists – Kathy draws, paints and stitches. I’ve always loved what Kathy does – even though I once thought she was up to no-good, rooting around under the tables in a neighbor’s booth at Market. I had told Bonnie Sullivan of All Through the Night that I would watch her booth while she ran to an appointment, and I took the responsibility seriously! Each of these little “blocks” measures about 3 1/1″. Kathy does beautiful embroidery. 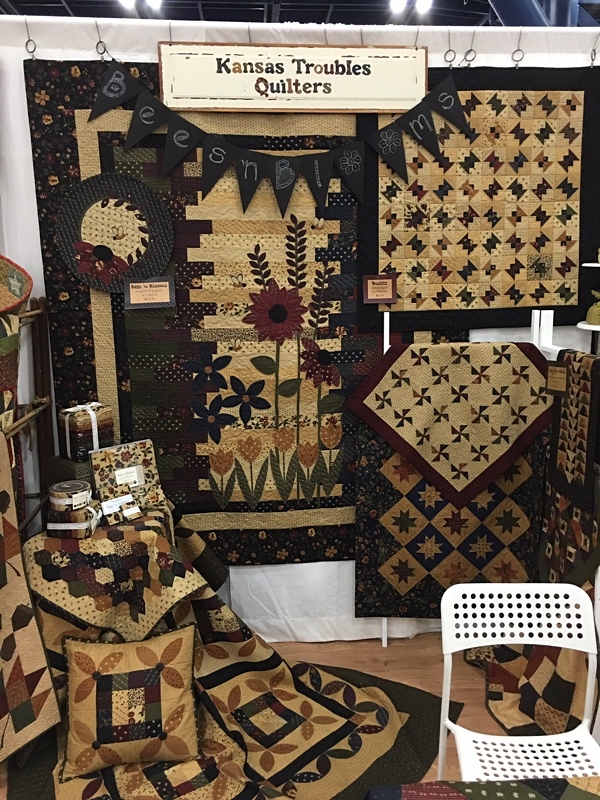 I love that both Alma Allen and Barb Adams will be at Fall Market this year. 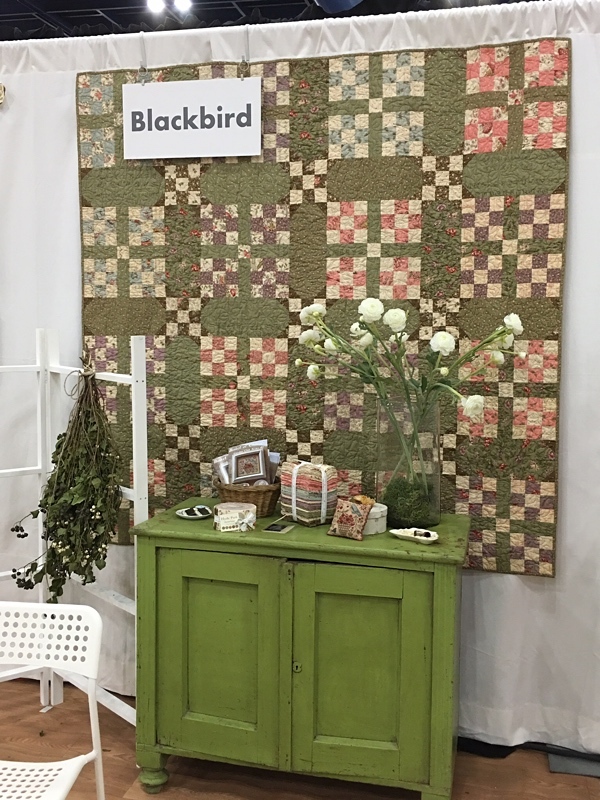 They are Blackbird Designs – quilters, cross-stitchers, artists. Two of my favorite people. Ever. This is their Hyde Park collection – it’s beautiful. Their next collection – I can’t tell you the name of it yet – will be shown in late December. 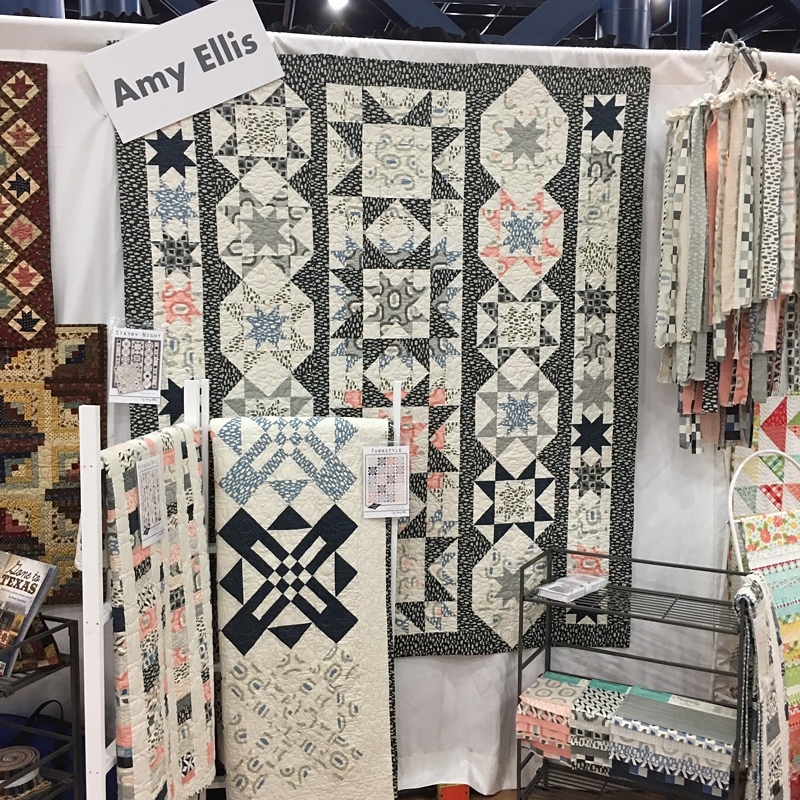 I know many of you have said that you would love to attend Quilt Market, and that one of the reasons would be to meet a few of your favorite designers. I hope Barb and Alma are on your list of “would love to meets”. 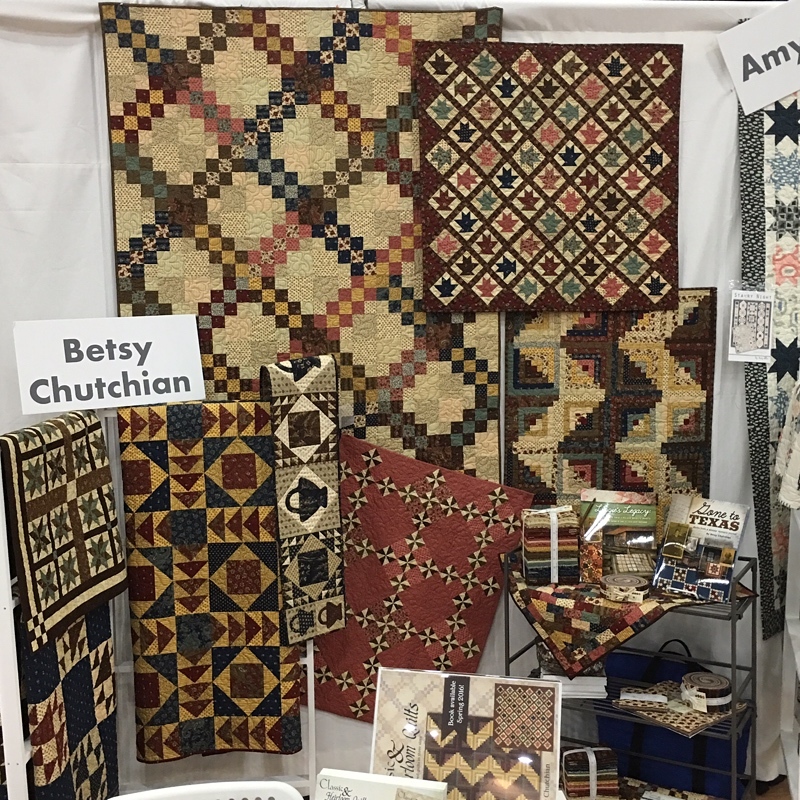 They make us all – quilters and women – look really good. Kaari! The French General and Ville Fleurie. Kaari Meng’s latest collection includes her signature Pearl, Roche, Faded Red and vibrant Red colors, but this one adds a lovely Lavender that I’m sure is inspired by the lavender fields near the Chateau Dumas of Kaari’s getaways, and a beautiful Aubergine. 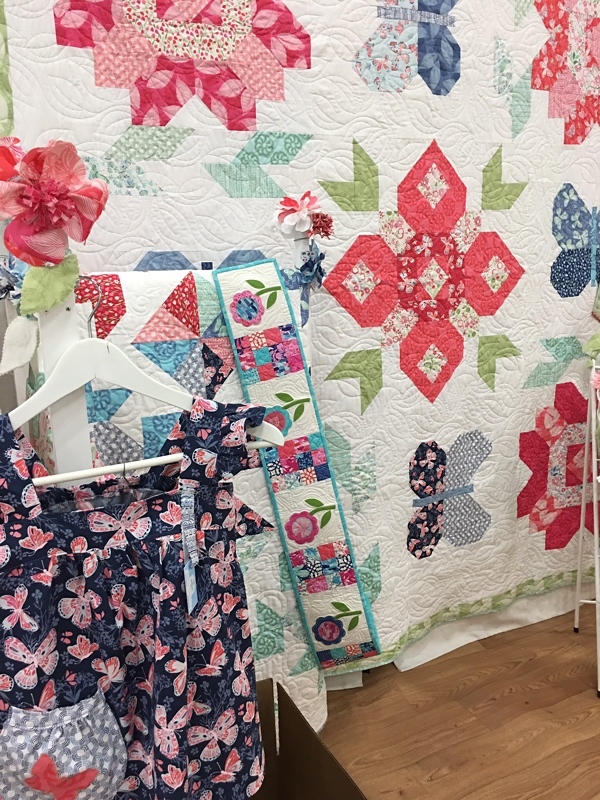 Betsy has done a beautiful book with the folks at It’s Sew Emma – big quilts and minis. I don’t know if you know but Betsy has always made a mini version of her big quilts first to check color-placement, proportion, etc. So when she was working on the quilts for her new book, it seemed logical to include the patterns for both sizes of quilts. Amy Ellis and Serenity. Navy to medium blue, light gray to charcoal and almost black, and then a beautiful pink that has a hint of peach-coral. It’s beautiful. 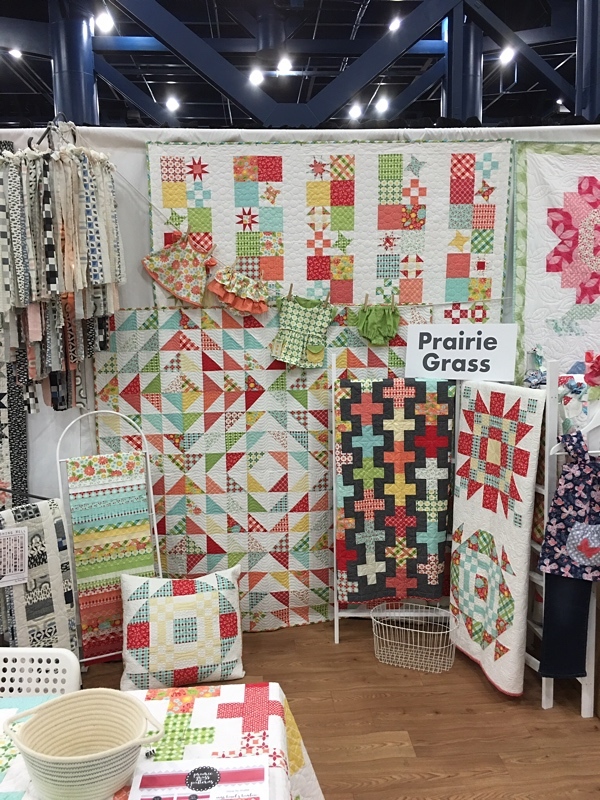 Amy and April Rosenthal of Prairie Grass Studio were the perfect neighbors – they were helping each other hang quilts and set-up their booths. I don’t know if April’s sweet little girl Hazel will get to wear this adorable little outfit but I sure hope so. “Signature style”. When you see a fabric or quilt, you know who the designer is. 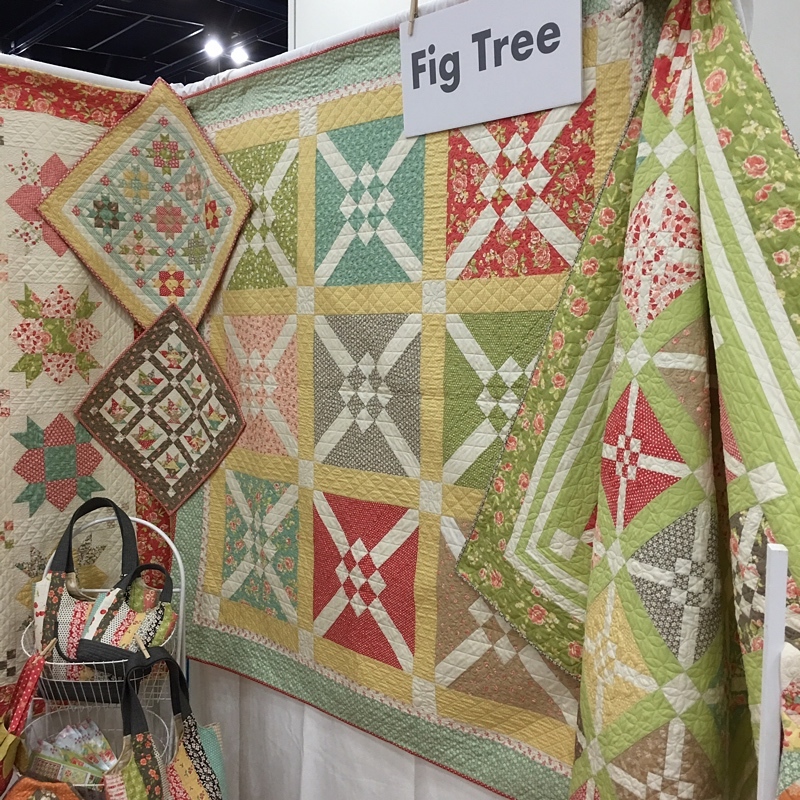 Joanna Figueroa has that – a color palette and style of quilt that is unmistakable – and unique. Annex? I couldn’t think of what else to call it… but it’ll make sense later. I hope. If you’re on Instagram, there are more pictures coming tomorrow – scout’s honor. Periscope? Been there, done that… keep forgetting to announce it ahead of time… but Saturday morning. Definite. There’s plenty more but it’s 1:10 am and if there’s going to be “more”… one of us has to get to bed. WOW! Loving every minute of this 40th Anniversary party. 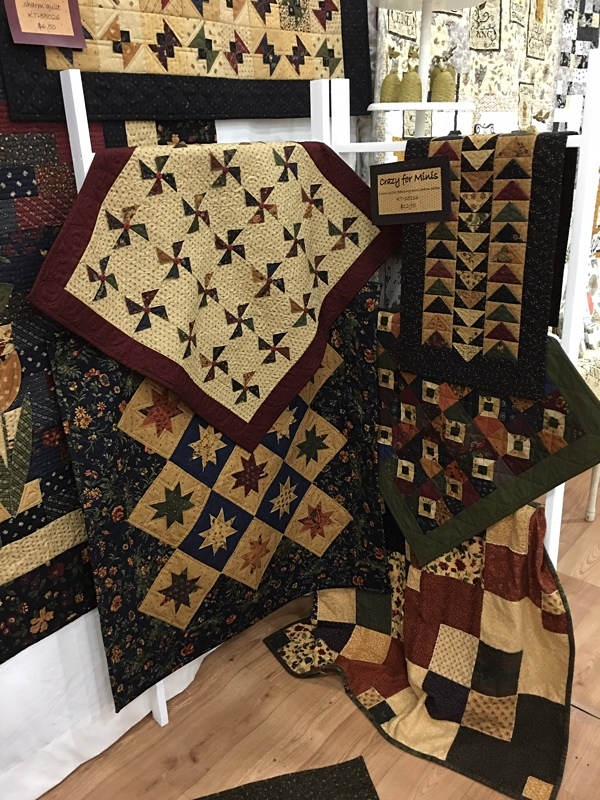 I am in awe of all the beautiful quilts! You would think that after all these years that the “older” designers would run out of ideas. News Flash, they continue to inspire and create new quilts using fresh colors. Thank you, Carrie, for your lively commentary and wonderful pictures. Love the tour, Carrie. Thank you! 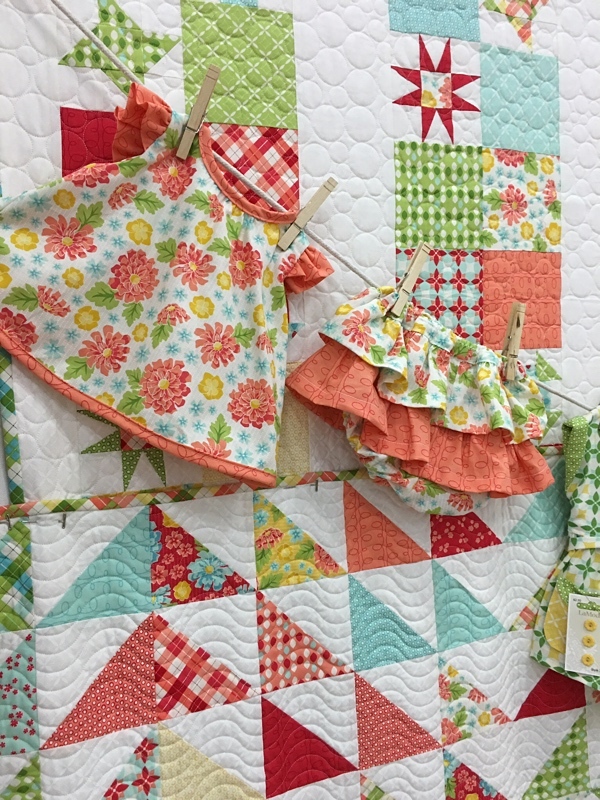 I want ALL the fabric……and those beautiful quilts. Is this what Heaven looks like? ♡♡♡. 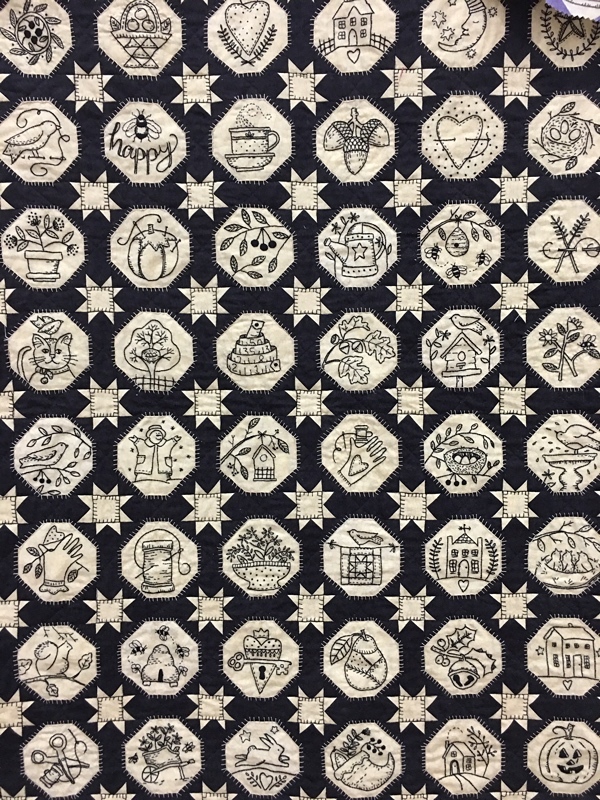 Who made the “Mark Dunn” Moda Quilt? 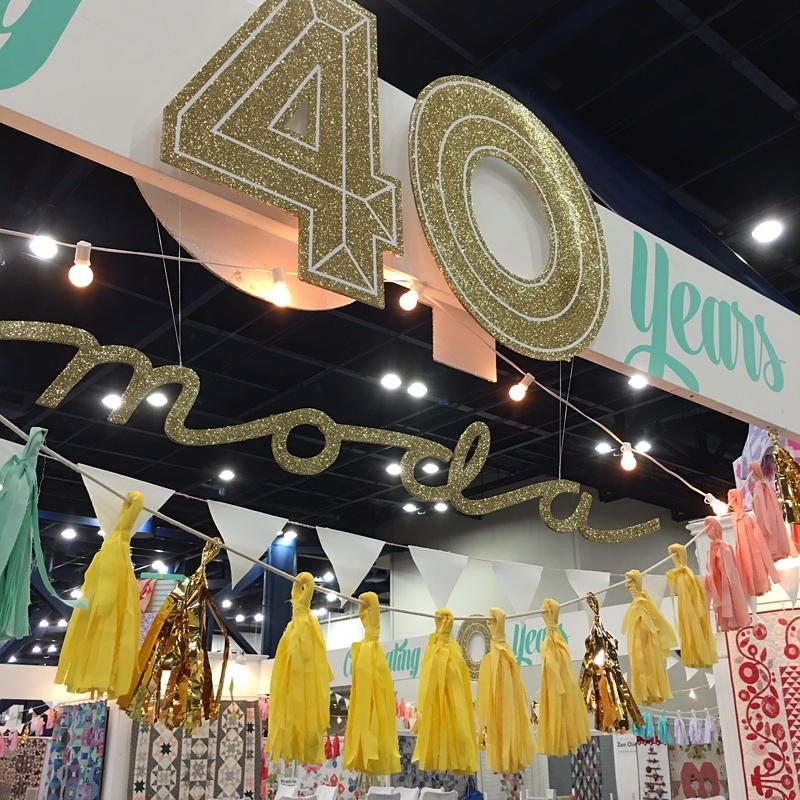 love all of the Moda displays ,……. wonderful!!!!! Maybe some day I will be able to be there in person!! As always your blogs are wonderful. 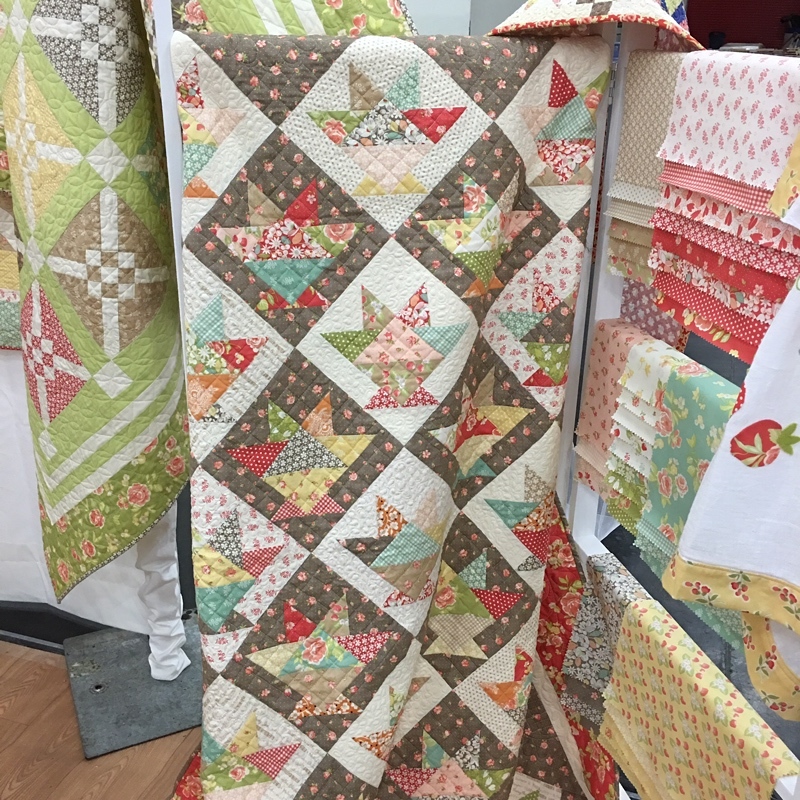 I’m so glad you pointed out that sampler quilt with the plain print blocks. I love that. Wow, 40 years!! That is just amazing!!! Happy Anniversary to you Moda/United Notions!!!! Wish I was there to join in the celebration 🙂 Thank you so much for sharing all of the amazing displays Carrie!! Loving all of the new lines!!! You are GREAT….to post this for those of us not at Market. Pace yourself…I want to see it all and it is too easy to crash….market takes a lot of energy! Beautiful quilt tour! These designers are so amazing! thank you so much for sharing all the beautiful new designs and fabric. Oh my, where will I start, and so much to finish. What fun to be there, I would be in total overload. Wonderful show!! Such eye candy!! I can’t wait to see what Jen Kingwell has been designing!! Please show and tell!! WOW! Thank you for sharing this beautiful show. Fabrics, quilts and designers. Looking forward to part 2. Congratulations to 40 years of wonderful things. Again thank you for sharing. Thanks for sharing with us Carrie … I miss getting to go to Market, I really enjoyed it when I worked for a LQS here in Houston – but your post and pics make me feel like I’ve been again ! Can’t wait for QF this weekend !!! 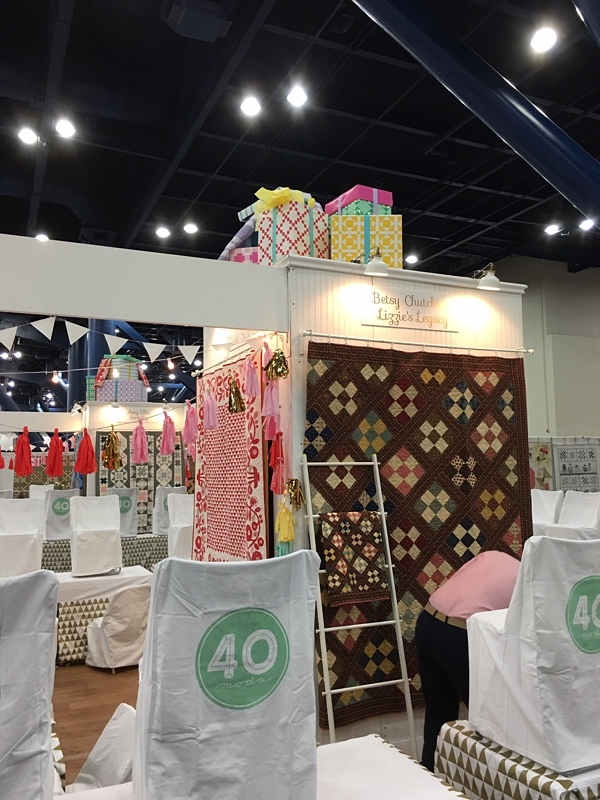 Congratulations to 40 years of wonderful fabrics. Regards from Brazil!